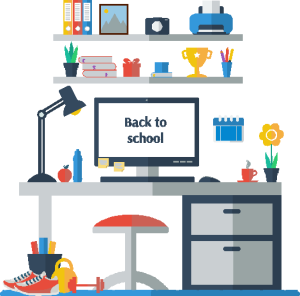 With school starting, it’s time to do a little reorganizing to make early mornings and after-school activities run smoothly. When starting school after moving to a new home, consider some of the additional challenges your children face and plan accordingly. Implement changes to the household gradually so that your kids adjust before that big first day! Creating a shoe station at the door saves time on hunting for that lost shoe and keeps wet, dirty or muddy prints from tracking through the house. Consider a separate shoe cubby for each child and hang hooks above each cubby for jackets and backpacks. If your child plays sports, create a separate cubby for uniforms, equipment and sports shoes. Starting a new school in a new neighborhood requires advance preparation. If your child walks to school, take the time to go over several routes to and from school. Learn where crossing guards assist on busy streets and where sidewalks offer safety as they walk to and from school. Locate bike lanes and the safest biking routes from your home. Locate bus stops and learn the correct bus numbers. If you’re looking for a home in a specific school district or need information about your neighborhood schools, check with your local real estate professional for up-to-date statistics and data.